Today I have for you a super simple, good for you recipe that takes no time to make at all! It’s my Detox Water. 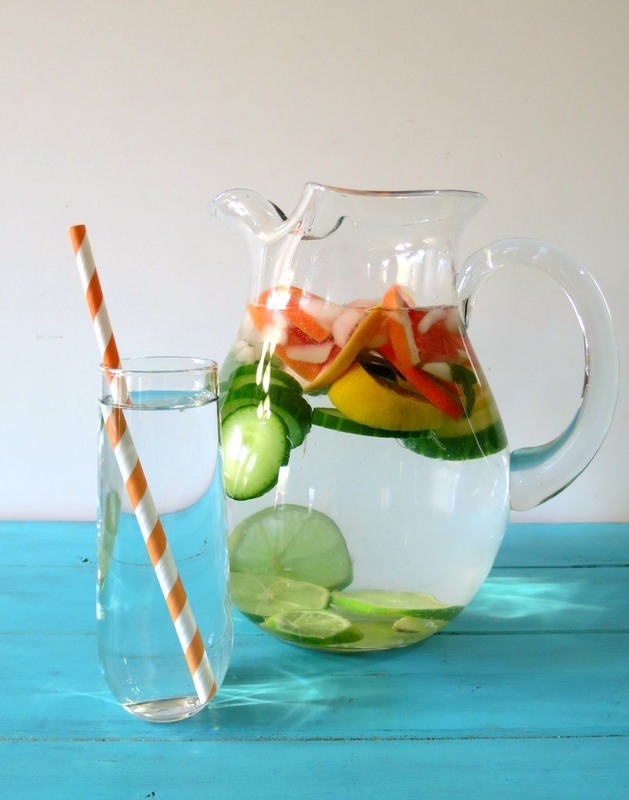 Yes, I am sharing with you a water recipe. Trust me, you will love this water, especially for those who don’t like to drink plain water. My Detox Water is not your traditional kind of water, it contains all of the components to make you feel good. It cleans out your kidneys, helps with bloating, it’s great for the skin and helps detoxify any bad germies in your system. As a plus for me it works great to help with your digestive system. It’s made with fresh cucumber, lemon slices, lime slices, grapefruit slices, fresh sliced ginger and fresh mint leaves. 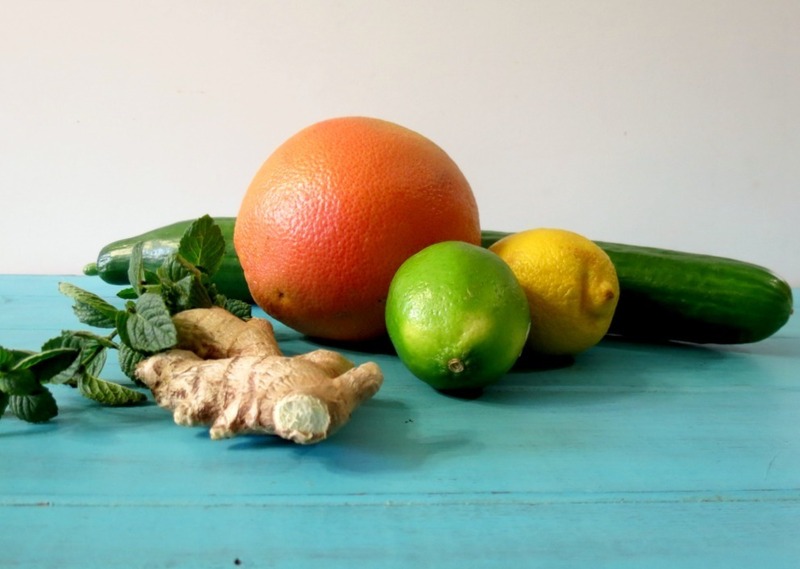 Lemons, grapefruit and limes – Citrus fruit helps detoxify the kidneys, and the lemon has antioxidant compounds called limonoids that activate detoxifying enzymes. Ginger – Is a digestive tonic that aids circulation. Peppermint – is a natural appetite suppressant and antimicrobial that eliminates germs in food and makes you feel fuller. Cucumber – It fresh, helps de-puff your body and is excellent for your skin. I make this water before I go to bed so I have it first thing when I wake up before your morning cup of coffee. I recommend drinking at least 8 cups of this water a day. I try to go 10 cups. First thing in the morning, when you get up. 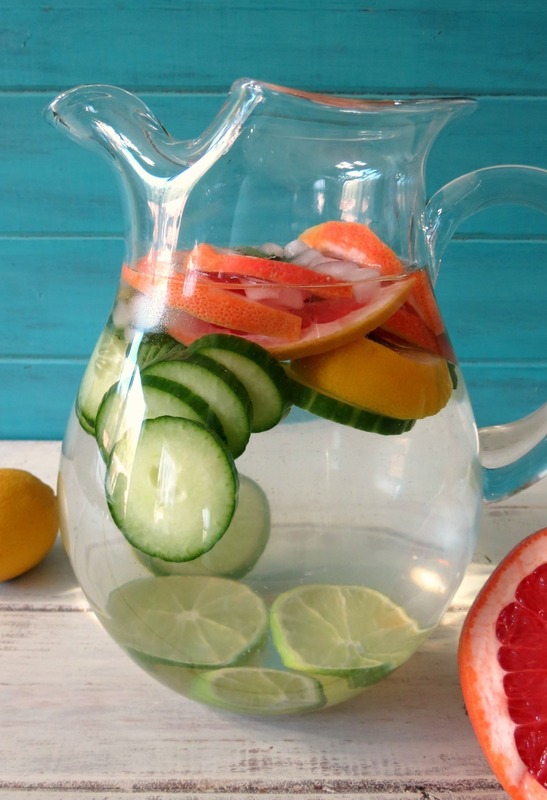 A refreshing pitcher of water filled with fresh fruit that will help detoxify your body. In a large picture add all of your ingredients and give it a mix. Add some ice cubes if you like. Place in the refrigerator for at least 2 hours before drinking. Discard the water after 24 hours if you don't drink it all. Please be sure not to drink it after 24 hours, as the fruit tend to get soggy, strong tasting from the citrus. Also, you can also add sliced oranges if you like. No calories in this drink! Drink as much as you like and enjoy! Not only am I detoxifying my body by drinking this water everyday, but I am also going to do that with my life, starting with the kitchen! I have cleaned out all of the bad, overly to processed foods, cleaned out the cabinets and drawers and cleaned out the fridge. I also cut up fresh vegetables, checked my fruit for blemishes and got rid of the old. I now know I am on my way to a healthier year. I can only hope that it will stay that way!! I am really looking forward to 2014, I just know it will be a great year for health!!! Now to get my Husband on board! Have a wonderful day!! Be sure to drink your water! P.S. Tomorrow I have the most awesome recipe! It contains peanut butter and chocolate. But that’s all I’m telling you!! LOVE this, I really need to get rid of all the bloat!! Well, this makes drinking water so much more fun! Happy 2014! Thanks Marie! I agree! I have a pitcher at home and I made one for work! I got my co-workers to drink it too. So much better than boring water! Happy New Years to you Marie!! 8-10 cups a day ! I have a problem just drinking 4 cups of water a day….don’t think I will be able to do this, but will tell my daughter, she may want to try this…..it looks very good…. You should try! Have a cup before every meal and when you get up in the morning. Try it for a couple of days. You’ll feel better about yourself and it fills you up! 🙂 Believe me I know, it’s hard to drink water, I tend to slack on it myself, but I’m trying! Not only is it good for the insides, but it’s also great for your skin! 🙂 Happy New Years!!! Happy New Year, Jen! I love your recipe for detox water. 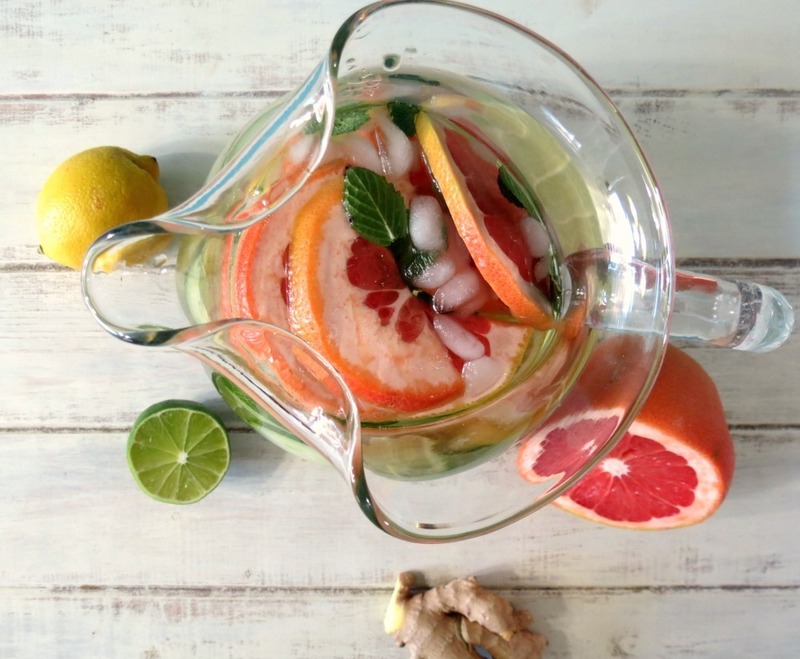 Back in the summer, I started making jugs of water flavoured simply with slices of orange or lemon, with cucumber and different herbs. Processed juice has too much sugar and I’m really bad about drinking enough water in a day so I thought that flavoured water was the perfect alternative. I can’t wait to try this! Hi Nancy! I agree about juices, and I tend to drink them a bit to much, that’s why I made the water. Something easy to grab, tasty, healthy and guilt-free. I have been bad at drinking water too and flavoring your water makes it so much easier. Happy New Years to you Nancy!! This looks lovely! In an effort to cut down on cost – could you use the same ingredients the next day and just add fresh water? Or would that be nonsensical? Hi, I found that longer than 24 hours the citrus fruit taste bitter. However, when the water gets low, I do just add more water to save on re-making it again. i definitely need this. it looks great! Thanks Dina! I have been drinking all week and I just love it! Thank you for this recipe. The photos are beautiful, and so is the drink itself. I made a pitcher of detox water today (at least a variation of it). It was super easy, healthy, delicious. Thank you! Your welcome Pam. I have been making it since I posted it. I love it and I too make different variations because I’m out of ingredients. Thank you for the comment. lol, I love this drink and I feel good having it too! I am currently compiling more including yours. Let me know your views..
Is it really bad for you to keep pitcher longer than 24 hrs? Soggy ingredients don’t bother me. I’ve been letting it fuse for a week–I just keep adding water and drinking. Hi Janice, I keep it for a couple of days. If the ingredients start to get to soggy, then take them out, the flavor is infused. Enjoy! Hi thanks for wonderful recipe for detox. just few question. is that good if i dont use ginger? bcoz its difficult for to to drink after add ginger on it. I know without ginger may not work like with ginger. But you can suggest me any others instead of it. Hi thanks for the wonderful recipe for detox. Hi! The fruit is good for about 2-3 days. Citrus fruit stays in tack and gives good flavor. Hope you enjoy! 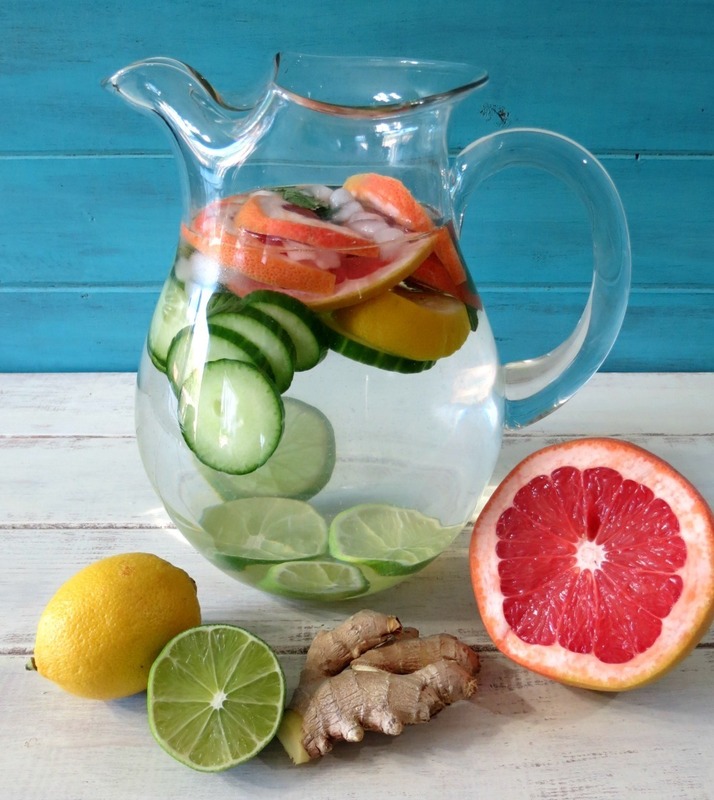 Is it ok just to use the lemon, cucumber and grapefruit….by the way I had peeled the grapefruit and put it in the water was that ok? Of course! Bottom line is as long as you drink water and if it tastes good, then that is all that counts. Cheers!